Keeping in mind diverse requirement of the clients, we are offering a wide array of Knapsack Manual Sprayers. These products are made by using quality material which is sourced from leading vendor of the industry. Besides this, we test the quality of these products before being dispatched in the market. Strong pump set with motor capacity of 4.5 PSI and 12 12V Battery. Peekay Farm Equipments (i) Pvt. Ltd.
We offer a wide range of Knapsack Sprayers in the market. The Knapsack Sprayers made accessible by us are made of high quality raw materials and are available in different capacities as per the requirements of the clients. We offer the sprayers at the most discounted rates as against the ordinary market. 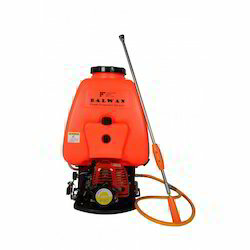 We are the manufacturers and Exporters for Knapsack Sprayers. Our Knapsack Sprayers widely used for spray in the fields on the crops. We are manufacturing Plastic Knapsack Sprayers. Capacity for the Sprayer is 16 L. Most welcome for your queries for the best prices as well quality. Knapsack Hitech Sprayer 16 Ltrs. - Heavy HDPE unbreakable Tank with 16 liter capacity. - Heavy HDPE unbreakable Skirt. knapsack sprayer is designed for spraying pesticides and weedicides on all types of field crops. 16 lit. plastic injection molded tank fitted with adjustable shoulder straps and suitable for left or right hand operation, tank is provided with bigger filler hole and deep strainer for easy filling. 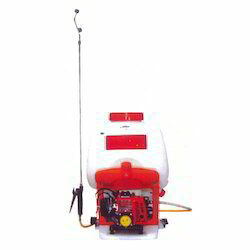 Knapsack Sprayers are another category of agricultural sprayers offered by us. These consist of Pressure Vessel and Pumps, which are fabricated from quality raw material. Our range serves the application needs of users for long span of time without causing any type of trouble. These user friendly sprayers are offered by us at market leading rates to our clients.